It’s what I want to say sometimes, when people give me a funny look after they find out that I got breast cancer in my 30s. Even when I’m a jerk, I don’t get the funny look. When someone gives me the funny look, I’ve noticed that they avoid me thereafter. It could be that they’re uncomfortable around cancer. I don’t think that’s it. For the record, I have not had an abortion. I’m not a scientist and I do not work in epidemiology nor public health. I have not personally run the statistical analyses of breast cancer rates and abortion rates, so I can’t personally speak to whether there is a link between breast cancer and abortion. Instead, I look to the people who study these things. The National Cancer Institute, the American Cancer Society, the American College of Obstetricians and Gynecologists, and the Royal College of Obstetricians and Gynaecologists have examined whether there is a link and concluded that there is not. 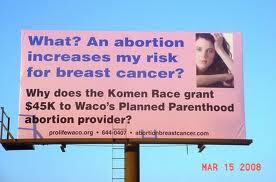 According to science, there is no link between abortion and breast cancer. According to people who believe that there is a link between abortion and breast cancer, there is a link between abortion and cancer. You can’t fight faith with facts, and for a great many people, the purported link between the two is a tenet of faith. They believe it, and their belief causes them to give me the funny look. I’m not sure what to do about the funny lookers. I wish they would just ask straight out. They might not believe me when I said, “No, I did not have an abortion,” but it would be a start. I’ve rarely heard anything so stupid in my life. I would feel relative tolerance hearing this from a fundamentalist country that feels obliged to believe it detains the truth and nothing but the truth on religious matters. They just haven’t come around to the 19th, 20th and 21st centuries yet, I can forgive. I can respect tenets of faith. I cannot forgive this sort BS from the United States. Ok, I do know about hard-core believers of the 7 day creation cycle, Sarah Palin (she’d be fine in Iran), the buring of Corans to *commemorate* 9/11…but this is different – no words, just casting an eye – from one you-and-me to another you-and-me. Thanks! It’s hard to know what to say to a *look. * Humor is definitely the best way to deal with it.